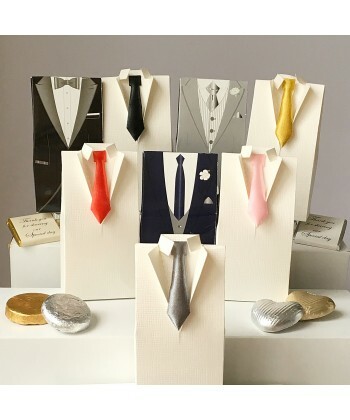 Men's Tuxedo table favours available in a variety of colours and styles suitable for weddings, special occasions or corporate events. Supplied readymade and pre-filled with a choice of premium quality foil wrapped chocolates. Click to view a selection of ribbon colours, chocolate fillings and to order your Tuxedo favour boxes.